For anyone who has every wished they could experience the Oregon Trail computer game in real life, Yosemite Pines RV Resort and Family Lodging offers the ultimate glamping experience. While the accommodations are far cushier than what the settlers were sleeping in, the experience offers a taste of a simpler time. Set to open just in time for Labor Day weekend, Yosemite Pines RV Resort and Family Lodging now offers Conestoga covered wagons for guests who want a different kind of camping experience. 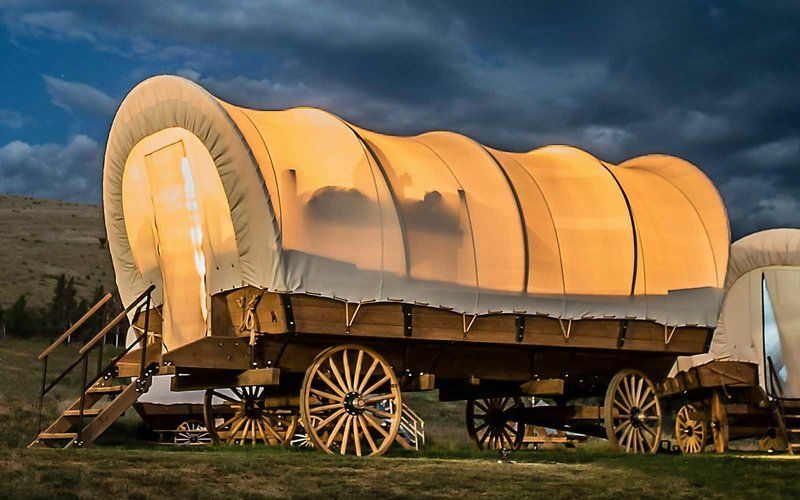 While the outside of the covered wagons look like something straight out of Oregon Trail, the inside is decked out with king sized beds, air conditioning, heat and even a mini fridge. The bigger wagons can accommodate as many as six people, while the smaller wagons can hold up to four. All of the wagons also come with an outdoor fire pit and picnic area so you can experience the great outdoors without sacrificing creature comforts.